Adding medicine ball exercises to your golf resistance training program is another way to develop and strengthen the muscles using during the golf swing. They come in a variety of sizes and weights so truly anybody, regardless of age or skill level, can utilize them. Medicine ball exercises are one of the oldest forms of strength training. They have been used for thousands of years, and have come in many different forms. Ancient med balls were made of animal skins and filled with sand. Despite the fact that this type of exercise has been around for ages, many of the basic principle still apply today. Current versions are typically made of leather, vinyl, or rubber. These outer shells hold in place any number of materials on the inside. I prefer to use conditioning balls that have a rubber coating on the outside, simply because they are much easier to grasp and hold onto when throwing and catching. As health and wellness became more prevalent throughout the 20th century, medicine ball workouts have become more popular with those looking for ways to build quick bursts of strength. These quick bursts are often referred to as plyometric training and are invaluable for athletes looking to improve performance. Your muscles can be classified into two common categories: fast twitch and slow twitch. Just like the name implies, fast twitch muscle fibers contract very rapidly, and are used for quick bursts of force. When you accelerate to make contact with the ball, you are using these fast twitch fibers. Other athletes that rely heavily on these fibers are power lifters, basketball players, and sprinters. Slow twitch muscle fibers are just the opposite. The are unable to react as quickly and are typically used in endurance type sports such as cycling and running. 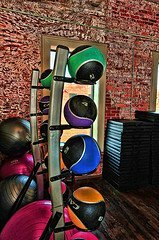 Med ball workouts are primarily performed for upper body strengthening, or to perform core exercises. They offer versatility and can pose new challenges for anyone tired of traditional exercises. While some exercises can be performed independently, one advantage (or disadvantage, depending on how you look at it) is that you may need a partner in order to get the maximum benefit of a medicine ball workout. Looking specifically at golfers and the golf swing, these exercises need to focus on the rotation component of the core primarily, in addition to some more traditional movements. Moving on to the upper extremities, quick bursts of strength targeting the pecs and shoulders will help translate to more power throughout the golf swing. 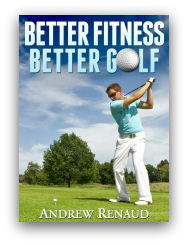 Also, combination movements such as chops and simulated golf swings will incorporate both the core and arms. Some of my favorite exercises work multiple muscles at once because I feel that they help simulate sport specific movements. Another key advantage of using these balls is that you are performing movements in more than one plane, which again, translates well to sports related activity. An advanced piece of equipment that I have recently discovered that can definitely help golfers is called a Tornado Ball. A tornado ball is essentially a med ball fastened to a rope which allows your to swing the ball in many different directions in order to develop explosiveness and power. When I said that they are advanced, I truly meant it! This is certainly not for beginners due to the high intensity of the exercises and the risk for injury. I have created a page dedicated to tornado balls and golf specific exercises that you can perform with them, so please check it out as well.